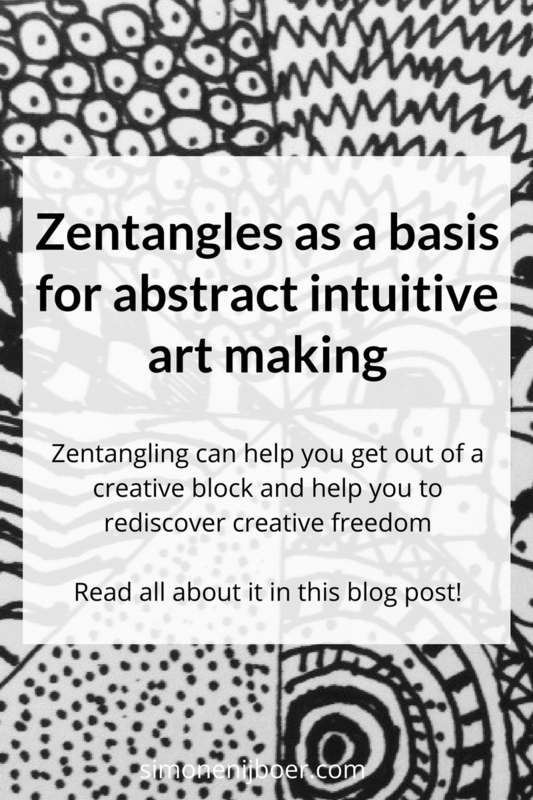 In this blog post, I will tell you about the inspiration I found in the Classic Zentangle, and how it became the starting point for the Free and the Extra Free Zentangle, and for abstract, intuitive painting in general. It all started last night when I could not sleep. I had done The Forbidden Thing: I worked on my computer until 10 o’clock in the evening. Staring at the blue screen, clicking around, switching tabs, comparing designs, as if I did not know anything about the detrimental effect that working late behind a computer has on your sleep. But: I was so excited about the design of my new website that I couldn’t stop working on it, and since there was no sweet husband at home who just would turn the WiFi off and tell me to go to bed, I just worked on until I heard him coming back. So when I could not sleep that night, I was not surprised. I knew it was completely my fault, and after half an hour of lying awake, I went down to make a cup of tea. Looking around for something non-stimulating to read, I bumped into a book about Zentangles that I had borrowed for my 11-year-old son. In the summer vacation, he had played around with a fine marker. 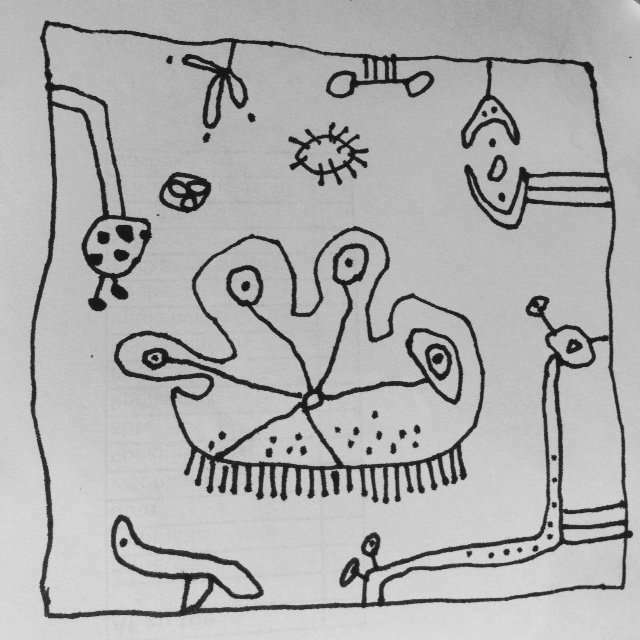 There he had made drawings that looked like Zentangles, so I thought he might like getting some inspiration from this book. When I looked in the book, I found out that there is a whole culture around these intricate graphic paintings. All kinds of predefined patterns exist, they even have beautiful and exotic names like Crescent Moon, Shattuck, Nipa, Betweed, Cruffle, Poke Root, Verdigogh, Btl Joos, Flux and Zander. Moreover, Zentangles are supposed to be meditative and to draw you into the Now. 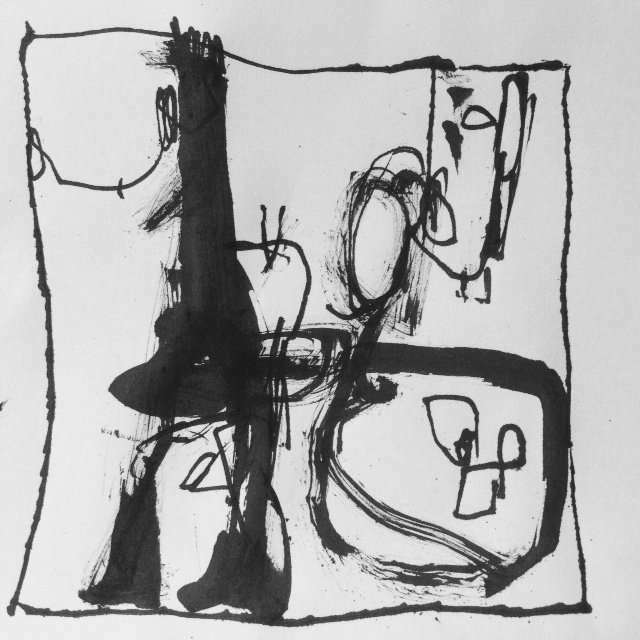 They get you out of your head and into the simple movement of the pen on paper, letting the pattern arise – without too much thinking. The writer of the book even claims that by regularly tangling your life gets more balanced. You can handle the daily chaos that most of us live in more easily and create harmony in your life. My aspirations were not so high that night though. I just wanted to sleep! I thought making a Zentangle would be the perfect thing to settle down, and help my chattering mind to become silent. But: to be honest, I became a little bit recalcitrant by the predefined patterns and the slightly ‘kitch’ examples in the book. So I thought: why not make up a Free Zentangle myself? 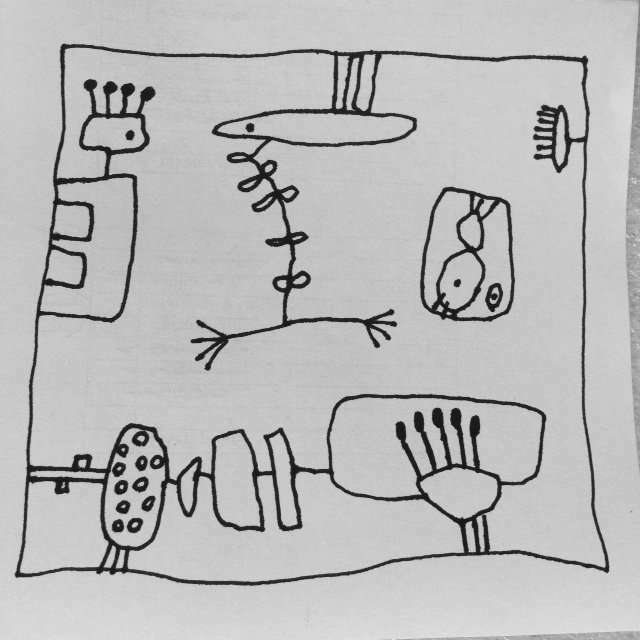 Not use the prescribed patterns, but just the images that exist in my head. While still being true to the philosophy of the Zentangle by letting the shapes arise by themselves, simply focusing on the process of moving the marker over the paper. Probably I widened the concept of a Zentangle much too far by not using patterns, but: who cares! In abstract art making, there are no rules and regulations, and you can get inspired by anything around you. 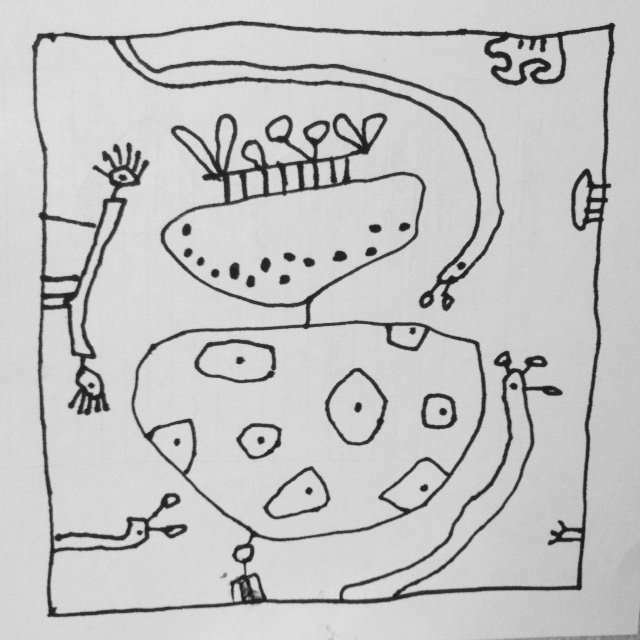 From the book I learned that the Classic Zentangle is about 3,5” square – that is 9 cm square. 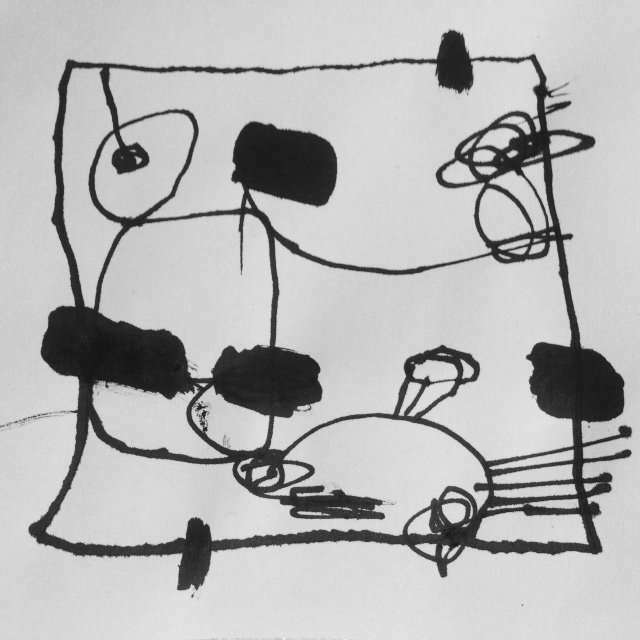 You start by drawing this square as a framework, divide it into parts, and start filling them with patterns. I liked the idea of making a framework, so I took that as a starting point. I took a simple marker that I also use for writing, and I started to draw. No thinking, just following my impulse. 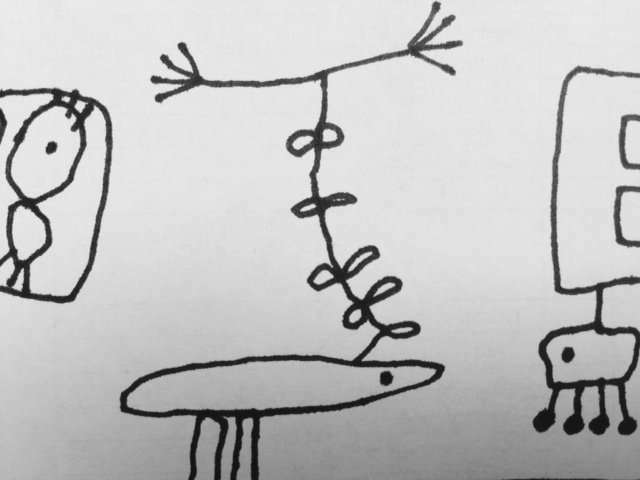 All kinds of imagery arose on the paper. Mostly shapes that I recognise from my other paintings, but also new ones. Some look like animals or sea-creatures. Some are just abstract shapes. I loved doing it, and I also liked the drawings that came out of the process. I found them beautiful and funny. After that, I went to bed, and indeed: I fell asleep! So I took Indian Ink, an ink pen, and a tiny brush. I made the same square frameworks as the night before and started to create lines and shapes. This time I worked much more expressive. I did not care so much about staying within the lines. Moreover, I did not only used them as a border but also as part of the composition. 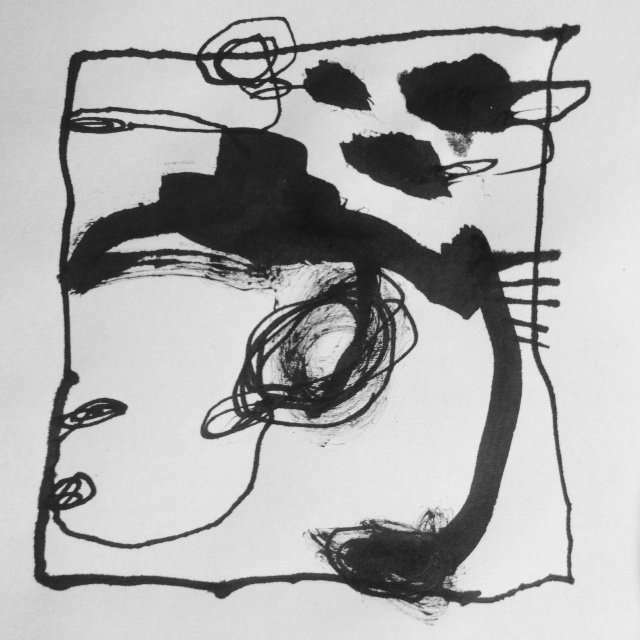 An ink pen is not as easily controllable as a marker, or better said: the ink pen gives you the possibility to make lines that are more alive. Sometimes they are thick, sometimes thin, sometimes wild, sometimes refined. You can make bigger stain-like marks if you turn the ink pen around and wipe the Indian Ink on the paper with the upper side of the pen. And you can splash ink drops on the paper shaking the pen. 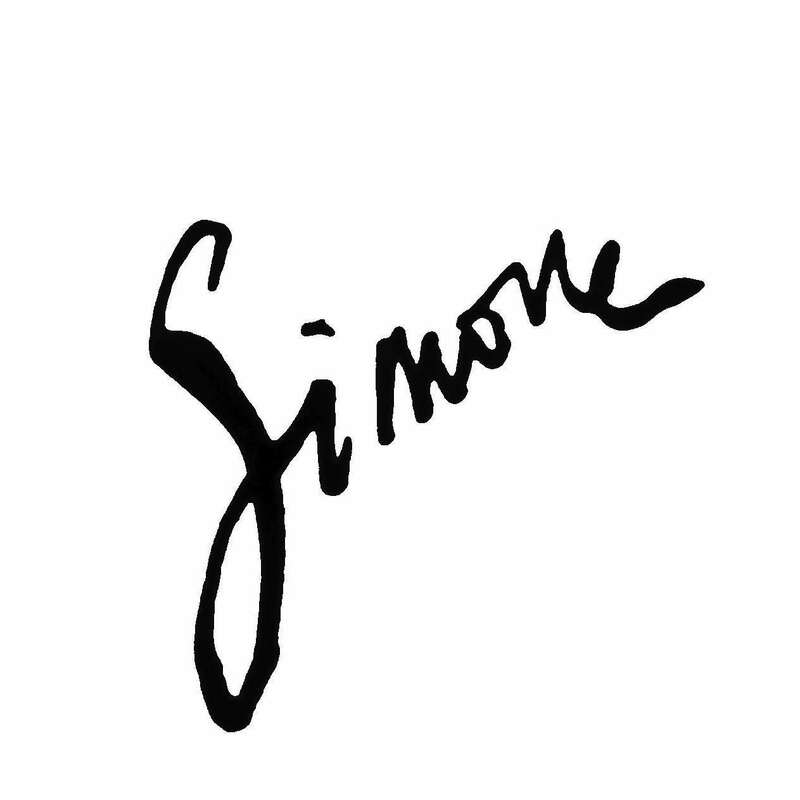 All those possibilities make the ink pen a much more expressive tool than a marker. Next, I used a small, very cheap and hard brush, which I dipped into the ink, and made even bigger marks and stains with it. They made a nice contrast with the finer ink pen lines and stains. To conclude my whole Zentangle adventure, I decided to honor the Classic Zentangle, and make one myself. I liked that very much! It was fun to sit down and play with patterns and let myself drawn into the process of making small marks on paper. I did not care about the examples in the book – making them would need thinking! So I just patterned along by myself – which is not too difficult if you have finished kindergarten. It indeed got me out of my head, since the patterns are so simple that I had nothing to think about. I think Zentangling can be a perfect part of a daily creative practice. When you feel particularly uninspired, or have little time or limited materials by hand, making a Classic Zentangle is a beautiful idea. It can stand on itself, but it can also be a perfect starter for a Free or an ExtraFree Zentangle. Or for an entirely other kind of painting or drawing. I hope you feel inspired to start tangling yourself – Classic, Free or Extra Free. Get out of your head, into the Now, and have fun! Let me know about your experiences below in the comments! 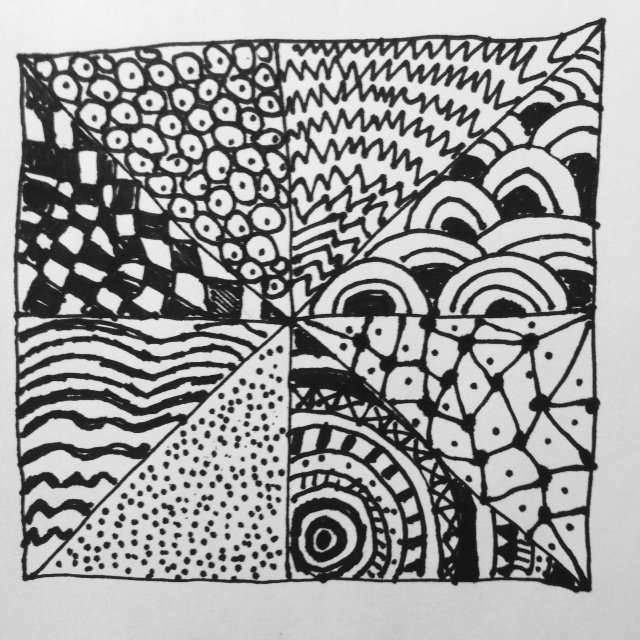 What a fun surprise to see your Zentangles and read your post! You’ve opened a new door and run right through into adventure! I’m eager to see how Zentangles play into your painting over time. Carry on, fearless one!